When I became pregnant and we invested in a body pillow designed for an expecting mother… I fell in LOVE! The “Snoozer” Dreamweaver pillow was truly heaven sent. It’s a 100% Goose Down Hypoallergenic full body pillow, shaped like a candy cane. And since many pregnant women have trouble finding a peaceful nights sleep due to the rapid ongoing body changes on the inside and out, this can definitely help…I remember thinking it’s THE BEST and totally worth it! 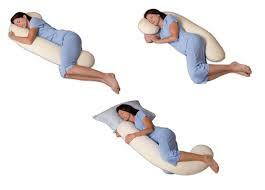 The unique, patented SNOOZER Full Body Pillow is ergonomically designed to follow the natural motions and positions of your body all night long. 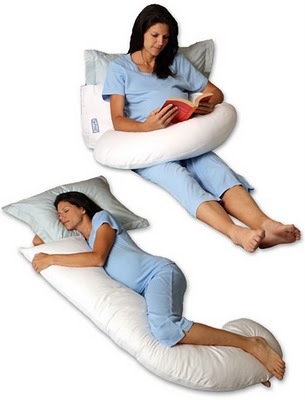 This proven design has been the benchmark for ergonomic body pillows since it was introduced over 14 years ago. By providing the support of 3 pillows in 1 design it is just the right answer for those that suffer from arthritis, injuries, pregnancy discomfort, back pain, or sore muscles. It also has other uses, like wrapping it around your expanding belly, so you set things on the pillow and not use your stomach as the “tray!” You can also use it to help position baby for breastfeeding once she arrives. The one I purchased came with its own custom “candy cane” shaped pillow case and the case and pillow both wash very easily in the washing machine!